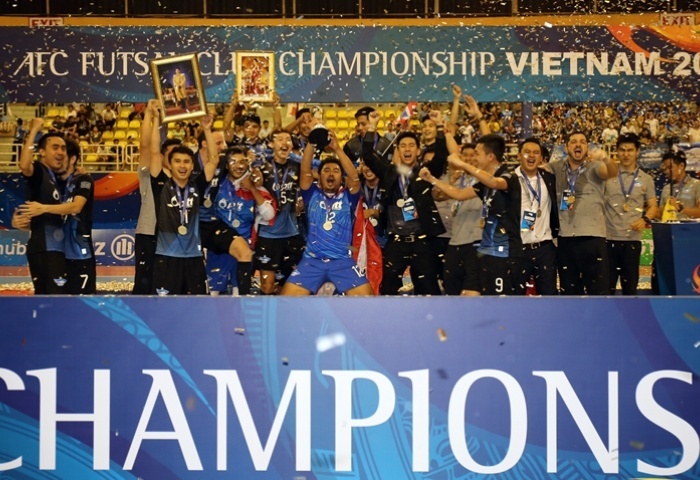 August 1 – The growth of Futsal in the Asian Football Confederation (AFC) region was re-emphasised as the AFC Futsal Club Championship Vietnam 2017 drew to a close at the weekend with Bluewave Chonburi taking the title in Ho Chi Minh. The 11-day tournament built on the record numbers achieved by last year’s competition in Thailand with the AFC’s Twitter account reaching a competition record 1,093,874 impressions while the AFC’s Instagram received 1,654,900 impressions. The AFC’s Facebook account also reached an all-time high with 1,744,454 impressions, while the AFC Hub Youtube saw 1,629,855 minutes of action viewed this month. “Futsal in Asia has made significant strides in recent years, our teams today stand proud amongst the world’s best. The AFC Futsal Club Championship reinforces the passion that exists in the continent and underlines our Vision to improve the popularity of our game,” said AFC President Shaikh Salman bin Ebrahim Al Khalifa. Thaliand’s Bluewave Chonburi were steered to their second AFC club title with a hat-trick in the final by Suphawut Thueanklang. Bluewave narrowly beat Iran’s Giti Pasand 3-2 in the closest of finals that could have gone either way. While the action on court is stimulating football fans in the AFC region, its administrators have moved off-court to strengthen the infrastructure of the small-sided format of the game. The confederation is introducing special Futsal Club Licensing Regulations “to enhance the professional landscape and quality of club futsal in Asia,” said an AFC report on the meeting of its Futsal and Beach Soccer committee. The new criteria are being encouraged to be implemented in domestic leagues and will subsequently be used in the AFC Futsal Club Championship. The committee also awarded the hosting rights of the next edition of the club championship in 2018 to Chinese Taipei, and the hosting of the 2018 edition of the AFC Women’s Futsal Championship to Thailand. The AFC hosted its first women’s Futsal competition in Malaysia in 2015, positioning the confederation at the forefront of women’s futsal development globally. In line with this Futsal development drive, the 2019 edition of the AFC U-20 Futsal Championship will now have a new qualification competition with five Zones qualifying 11 teams teams (plus the hosts) for the final tournament. On the coaching side the committee is recommending the introduction of a set of minimum coaching requirements for teams playing at AFC Futsal and Beach Soccer Competitions.